On behalf of the World Association of Non-Governmental Organizations (WANGO), and the Awards Committee, under the chairmanship of Dr. Noel Brown, President of Friends of the United Nations, I am delighted to inform you that the World Association of Early Childhood Educators has been selected as the recipient of the 2007 Education, Media, and Arts Award. The prestigious WANGO awards recognize non-governmental organizations (NGOs) from throughout the world that demonstrate exceptional effort, service, innovation, and excellence. These awards are presented to both large, well-known NGOs, as well as to smaller NGOs in less developed regions, whose valuable work may have slipped wider visibility. Among past recipients of WANGO awards are Rotary International, Ashoka, Arias Foundation for Peace and Human Progress, Inuit Circumpolar Conference, Free the Children, Bahrain Women’s Society, Altai Foundation, and Roots of Peace. In 2003, WANGO recognized the Green Belt Movement of Dr Wangari Maathai, the year before she received the Nobel Peace Prize. Another award recipient, Sheila Cloutier-Watt, is being considered for this year’s Nobel Peace Prize in a joint recommendation with the Honorable Al Gore. Another Award winner, Yusef Islam (Cat Stevens) of Small Kindness, received an award from a association of Nobel Prize winners shortly after receiving the WANGO Award. Recipients of WANGO’s Universal Peace Award, WANGO’s highest award to individuals, include Dr. Federicio Mayor, former Secretary General of UNESCO, Princess Maha Chakri Sirindhorn of Thailand, and former Zambia President Kenneth Kaunda. In taking the decision to present WAECE/AMEI with its 2007 Education, Media, and the Arts Award, the Awards Committee and Dr. Noel Brown particularly were impressed with the sincere and selfless dedication of the organization to the important task of educating young children in terms of values – values that can guide them throughout their lives. Through WAECE’s exceptional accomplishments, you are paving the way to a world of peace and well-being for all. We are delighted to recognize such efforts and bring greater worldwide awareness of the extraordinary accomplishments of the World Association of Early Childhood Educators. 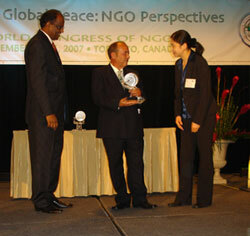 This Award will be conferred at the 2007 Awards Ceremony at the World Congress of NGOs, taking place on Friday, November 9, 2007 at the Delta Chelsea Hotel in Toronto, Canada (www.wango.org/congress). In addition, we would like to ask you to speak the next morning at our Panel of Excellence, a plenary session that will provide an opportunity for the current Award winners to share their insights in greater depth with the Congress participants. This would be in addition to your role in the breakout session on early childhood education on the morning of November 9. We are looking forward to meeting you and being able to confer upon the World Association of Early Childhood Educators the 2007 Education, Media and the Arts Award.